The stars were aligned and shining down bright on Vince McMahon and his Sports Entertainment Revolution that fateful night in March 1987. 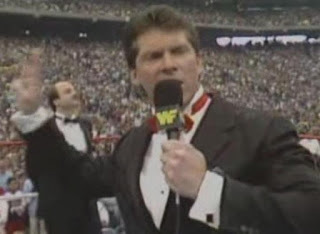 With a record breaking crowd, a commentary team unrivaled anywhere in the business and a stacked card leading up to the biggest professional wrestling match of, well, all time, Wrestlemania III looked set to live up to all of its hype and then some. Twenty-six years later, Wrestlemania III lives on as the one to beat, the standard bearer by which all other installments of WWE's flagship event are judged. Why? Let's find out, shall we? Resplendent in a typical 1980s' styled tuxedo and with his trademark growl ringing out across Michigan, Vince McMahon took to the center of the ring to welcome everybody to Wrestlemania III before introducing soul legend Aretha Franklin to the capacity crowd for a rendition of America the Beautiful. Music out of the way, it was on to our commentary team for the evening, Gorilla Monsoon and Jesse 'The Body' Ventura, accompanied for our introductions by baseball legend Bob Uecker and TV beauty Mary Hart. And so after spending the last two Wrestlemanias as Roddy Piper's lackey, 'Cowboy' Bob Orton finally got to see in-ring action at the big event. Teaming with muscleman Muraco to take on the fresh young babyface duo of Zenk & Martel, Orton's first wrestling contribution to Wrestlemania was a great way to start the show. Though hardly the longest match on the card, all four men worked hard within the time they had to deliver an entertaining opening bout which really kicked off the night's action in the right fashion. Following a good burst of back-and-forth action, Martel splashed The Magnificent One to pick up a win for the good guys. Your Winners: The Can-Am Connection. Up next, fans were treated to a recap of the ongoing saga between Hercules and Billy Jack Haynes, a story largely centered around which man's full nelson submission hold was superior. This took us backstage to the Wrestlemania Interview Center, where Mean Gene Okerlund hoped to get a few words from Hercules and his manager, Bobby 'The Brain' Heenan. In a curious comment, the brutish grappler claimed that he wasn't just Hercules, he was the Hercules. You know, son of Zeus, legend of Greek mythology? You've got to admit, Herc looked pretty good for being thousands of years old. When the two Full Nelson Masters finally met between the ropes, the result was a fun, enjoyable big man brawl. Both men (though Haynes in particular) looked like surefire headliners-in-the-making as they beat each other around the ring before toppling to the outside, where Haynes locked in the 'nelson and ignored the official as the ten count crept upon them. Hardly the best professional wrestling match that ever took place, this was nonetheless great fun from start to finish. 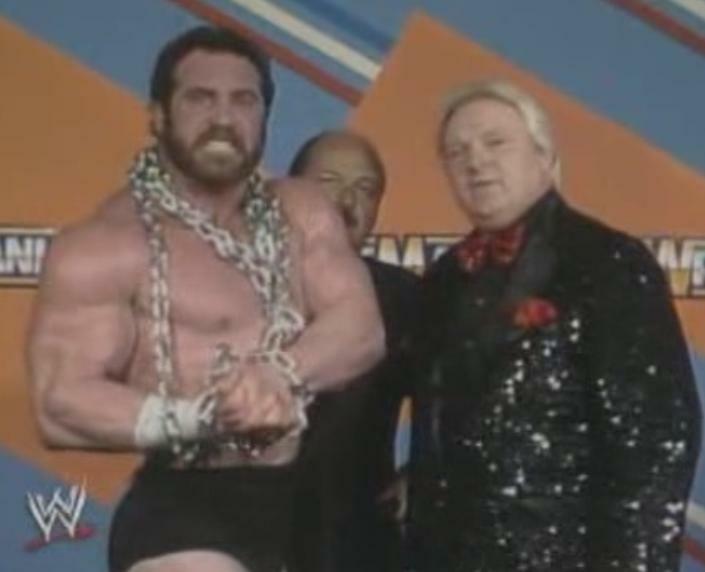 In the post-match shennanigans, Herc' used his trademark chains to bust Billy Jack wide open. 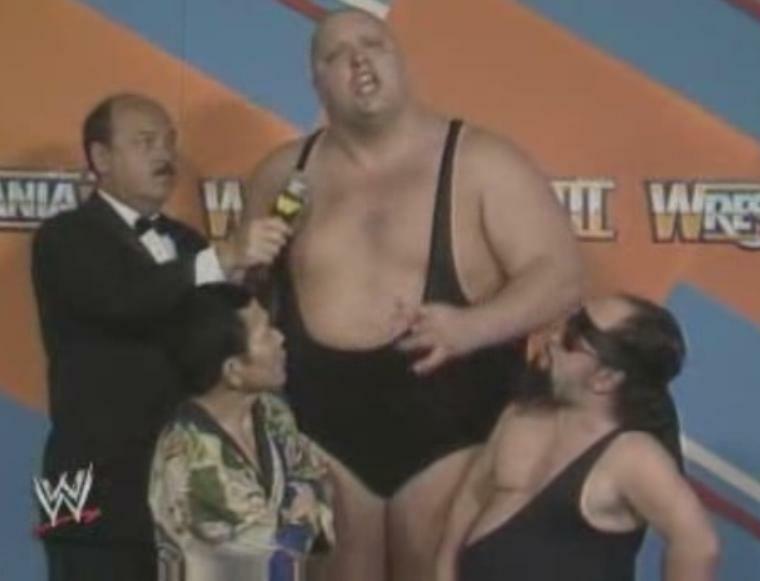 Heading back to the interview center for more pre-recorded comments, King Kong Bundy -with pint-sized partners Little Tokyo and Lord Littlebrook by his side- threatened, quite typically, to squash his upcoming opponents, Hillbilly Jim, Haiti Kid and Little Beaver. Offering a response, Hillbilly claimed he wasn't scared of Bundy, but did worry about his 'two little buddies.' Throughout the brief interview, Jim treated his partners not as the adults they were, but as little children, even going so far as to scoop up both Haiti and Beaver as a mother would her young offspring. It was quite weird. Speaking of Monsoon, he and Ventura were joined on commentary for this one by Bob Uecker, who was arguably the best thing about the whole match. That's not to say this was terrible (though to be fair it wasn't very good either), and for what it was, it was at least watchable, but your life won't be seriously ruined if you never see this match. The end came when Bundy beat up on Little Beaver, earning a disqualification as a result. Cutting once more to the backstage area, Mary Hart attempted an interview with the ever-lovely Miss Elizabeth, only for Intercontinental Champion 'Macho Man' Randy Savage to interrupt proceedings and order Elizabeth to start making her way down the isle. 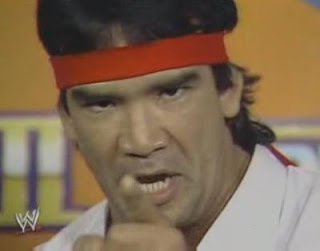 The Wrestlemania Interview Center must have been based in a different city or something; it would be at least half an hour before Savage's match against Ricky 'The Dragon' Steamboat took place. Either that or Liz was a really slow walker. 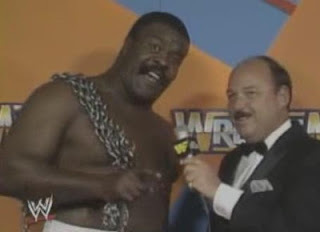 After a look at the feud between 'King' Harley Race and The Junkyard Dog over Race's reign as king, we returned to the Interview Center where Mean Gene caught up with The King, manager Bobby Heenan and, for no reason that was ever made quite apparent, The Fabulous Moolah. Your standard heel promo ensued, with everyone declaring that JYD would bow to the king by the end of the match. It was decent mic work from all involved, though not nearly as entertaining as guest commentator Uecker's reaction to the sight of Moolah. 'Moolah's here? No wonder you guys are here all the time!' the baseball legend enthused, totally ignoring the fact that Monsoon and Ventura were probably there 'all the time' since that was their job. 'I gotta get with Moolah!' he continued, taking off to apparently go find the former women's champion. That alone was hilarious enough to make watching Wrestlemania 3 worth it. Playing up the whole regency schtick, the laws here stated that whoever lost the match would be forced to bow before his victor. Before that however, we were treated to a decent little match in which Race bumped all over Michigan for his opponent before finally stealing a win with a release belly-to-belly suplex. Afterwards, Race took his rightful place on the throne (ie: a fold-up chair) and, as stipulated, JYD curtsied before the king. All was not finished however, as the Dog beat up his rival some more to the delight of the record-breaking crowd. Heading backstage once more World Wrestling Federation Heavyweight Champion Hulk Hogan spoke with Vince McMahon about his upcoming main event battle against Andre the Giant. The Hulkster gave a fairly nonsensical promo in which, I think, he promised to beat the giant. 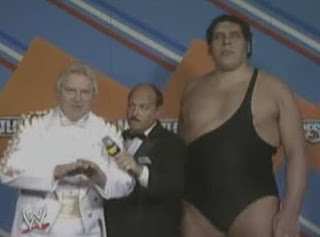 In yet another pre-taped interview, The Dream Team of Greg Valentine, Brutus Beefcake and Luscious Johnny Valiant were asked by Mean Gene Okerlund why they would need an extra man in their corner in the form of Dino Bravo. Johnny V replied, though I legitimately have no idea what he said apart from it having something to do with scrambled eggs. Back in the days before Jacques and Raymond became 'Fabulous', here we see them at their bland babyface best as they took the action to their larger foes in the early going. For a four minute match, this one turned out to be pretty decent with barely a dull moment in sight. After shenanigans involving Dino Bravo, the The Hammer scored the pinfall to give his team the victory. Yet whilst the match itself was great, the post-match angle made about as much sense as Johnny V's pre-match promo. For reasons that this writer still hasn't been able to figure out despite watching this match four times (two of those with the sole purpose of trying to work this out), Johnny V, Valentine and Bravo all took off, leaving Bruti alone in the ring. A face turn was approaching for Beefcake, though for what reason I guess we'll never know. Prior to the next contest, we were given a recap of the rivalry between Rowdy Roddy Piper and Adorable Adrian Adonis, all stemming from Adonis turning the Piper's Pit into The Flower Shop, and the faux-Scotsman not being best pleased with it. Piper gave his pre-match promo first, insisting that he wasn't afraid of 'a man in a dress' before Adonis blurted out something rather unintelligible (noticing a theme here anyone?) which seemed to swear that he would cut Piper's hair by the end of the match. Billed as Piper's last stand, Roddy would take off to make movies for a couple of years following this match though, as history has since proven, this wouldn't quite be the end of Hot Rod's in-ring career in quite the way it was advertised. Nonetheless, Piper received the largest ovation of the night to this point as he took the belt from his kilt and began whipping his nemesis around the ring. Adonis soon returned the favour, and the two proceeded to entertain the fans with a riotious slap-stick brawl. There was nothing good about this match from a technical wrestling standpoint, but for pure showmanship and a lesson on how to really work a crowd, this is a must-see match. Six minutes from the opening bell, Piper slapped on the sleeperhold and won the match, thus 'retiring' on a high note and keeping his hair. As per the stipulations of the match, Adonis was forced to have his head shaved. Yet rather than Piper do it, Brutus Beefcake returned to the ring and took the sheers to Adonis' blonde locks as Piper held manager Jimmy Hart to the mat. Again, no explanation was given for why Beefcake had any involvement in the match, though I'm sure it made sense to somebody back in 1987 and, even if not, we can all say we just witnessed the birth of one of pro wrestling's most memorable gimmicks; Brutus 'The Barber' Beefcake. In a quick, pre-recorded promo hyping the upcoming match, Jimmy Hart and The Hart Foundation put over Danny Davis as their new teammate. As The Mouth of the South did what he still does best, former referee Davis hung on the shoulders of Bret and Jim and smirked like a special needs patient having his photograph taken with his favourite wrestlers. For no reason whatsoever, Jesse Ventura was introduced to the live crowd before this thrilling six-man tag team match which came about as a result of Davis costing both The Bulldogs and Santana their respective titles (The Bulldogs the tag belts to the Harts and Santana the IC strap to Savage). Though they had less than ten minutes to do their thing, The Harts and The Bulldogs did what they did best and started to tear the house down. With the ever-reliable Chico also flying around the ring, this had all the makings of a classic, though instead it became mostly a good match built to put over Davis as a new wrestler. Indeed, the former official scored the pinfall over Davey Boy Smith to earn victory for his team. Heading to the back for more pre-recorded thoughts, Bobby 'The Brain' Heenan claimed that the butterflies were in his 'stomachs' (all of them?) as he was looking forward to Andre the Giant defeating Hulk Hogan in tonight's main event. Both men traded the offence in a decent, if entirely forgettable content which was over before it even really got started. Following a few short minutes, Butch Reed put away Koko for a short, painless victory. Following the bell, Tito Santana ran down to the ring for unexplained reasons and started to tear of Slick's suit. Yep. Up next, we got a review of the rivalry between Ricky Steamboat and Randy Savage, before both men exchanged words in anticipation of their upcoming Intercontinental Championship match. I will say one thing, the theme music WWE's production crew overdubbed for Steamboat gave the upcoming clash an altogether dramatic feel which was entirely fitting. World Wrestling Federation Intercontinental Heavyweight Championship Match. You know all about this match already, don't you? If you've been a wrestling fan for more than a day, you know about this match. Though modern indie fans weened on a diet of American Dragon vs. Samoa Joe may not agree, the Savage/Steamboat encounter was everything you could want in a professional wrestling match and then some. From bell to bell, both men grabbed your attention and kept you hooked all the way through, delivering an absolute gem of a match which saw Steamboat bag the pin, the win and the title. Heading once again to the backstage area, Jake 'The Snake' Roberts, flanked by some anorexic grandmother who looked a bit like shock-rocker Alice Cooper, promised to destroy The Honky Tonk Man when they met in the ring later that night. In retort, Honky Tonk vowed to nail The Snake with Shake, Rattle and Roll. And so when all the words were spoken, the only thing left to do was brawl. And brawl they did. By and large, this followed a similar path to many of tonight's bouts; hardly a wrestling classic yet entertaining enough from start to finish. Nothing truly memorable happened, but this was at least a watchable contest which came to an end when Honky cheated his way to victory. Gaining a measure of revenge, Roberts and Cooper then ganged up on the far-outmatched Jimmy Hart and threatened to put Damian on him. After the match, Mean Gene Okerlund announced that together, everybody in the building had set a new indoor attendance record of 93,000+, a record which wouldn't be broken for 13 years. 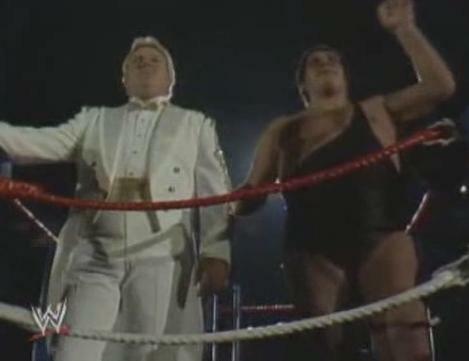 Slick, still in his Chico-torn clothes, led his foreign fanatics down to ringside before asking Howard Finkle to introduce Nikolai Volkoff for another heat-seeking rendition of the soviet national anthem. So yeah, go work that one out. When the action finally commenced it was fun yet entirely forgettable, with nothing of note happening until Hacksaw stormed the ring and cost The Killer Bees the match by taking out The Iron Sheik with his trusty 2x4. 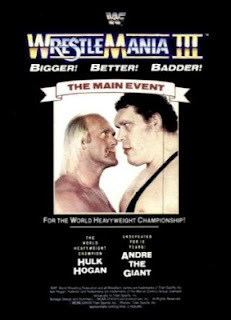 Finally, the only thing we had left was our main event, the reason those 93,000 and something fans packed into the Silverdome, the biggest match in professional wrestling even today; Hogan vs. Andre. Following a few last words from both champ and challenger, it was down to ringside. Bob Uecker (yes, him again) was our guest ring announcer and Mary Hart was our guest timekeeper, but nobody cared about that. Indeed, they were all here to see the biggest wrestling match that had ever existed. 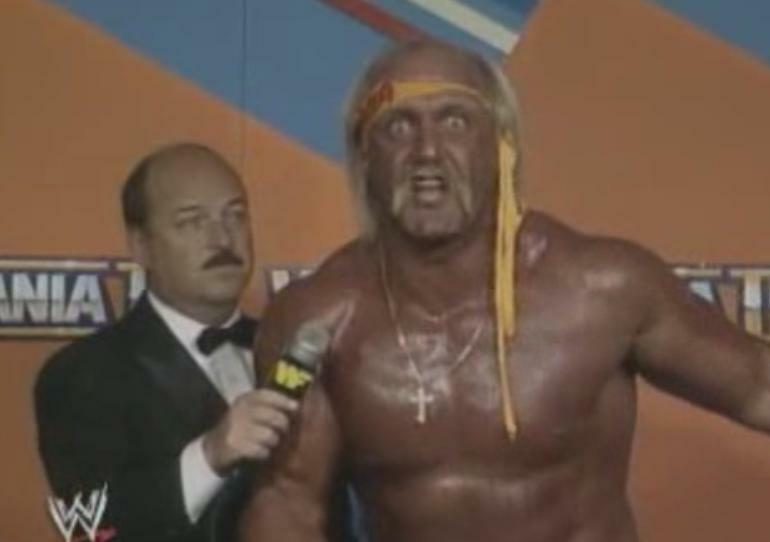 Even today in 2013, no wrestling match in history has quite generated the kind of fervent response that Hogan/Andre I did in 1987. Say what you want about Austin/Rock, Hart/Michaels or any other storied rivalry of the modern era, they all paled in significance compared to this one. It was the match upon which everything was focused the bout that built the foundations of today's WWE, and it was, well, your typical Hulk Hogan match. The champion took the blows to the challenger in the early going, only for Andre to block a bodyslam attempt by toppling onto his former friend for a near fall. The Giant then beat Hogan around the ring until the champion Hulked Up, hit The Bodyslam Heard Round The World, and scored the three count. Following the bell, Hogan celebrated by posing for the crowd for what felt like fifty years. And so, that was the card of cards, the Wrestlemania of all Wrestlemanias, and even now, it was an awesome show. Hogan/Andre lived up to the spectacle, Savage/Steamboat stole the show with an incredible performance and ever match before and in between entertained in its own way. Indeed, you won't find a card full of technical wrestling classics here, but you will find as solid, complete a show as you're ever likely to see. The first truly good Wrestlemania and the one against which all others are judged, this is essential viewing.